We have many approaches to find largest number among three numbers. 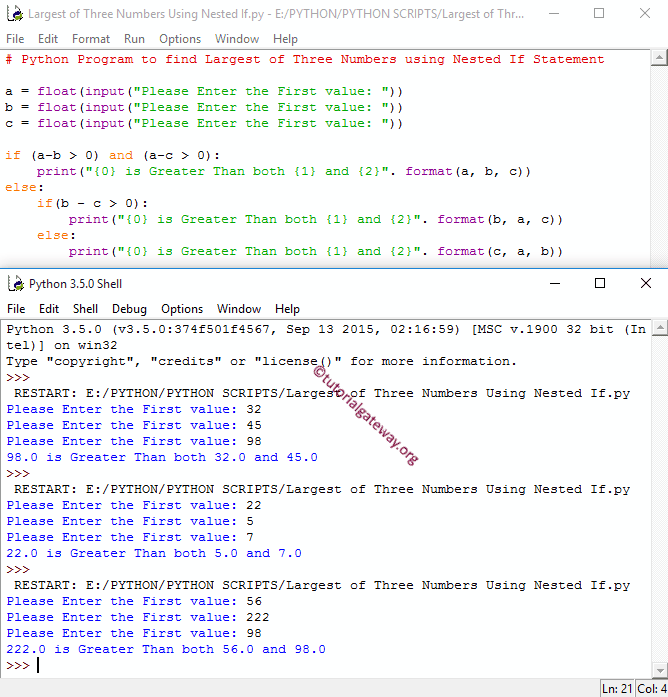 In this article we will show you, How to write a Python program to find largest of three numbers using Elif Statement and Python Nested If. First if condition check whether a is greater than b and a is greater than c. If both of these are True then following print statement will be displayed (a is greater than both b, c). First Elif statement check whether b is greater than a and b is greater than c. If both of these are True then following print statement will be displayed ( b is greater than both a, c). Second Elif statement check whether c is greater than a and c is greater than b. If both of these are True then following print statement will be displayed ( c is greater than both a, b). This program for Largest of Three numbers in Python helps the user to enter three different values. Next, it will find the largest number among that three numbers using Python Nested If. First if condition check whether a-b is greater than 0 and a-c is greater than 0. If we subtract small number from big number then this condition fail, otherwise it will be True. If this condition is True then a is greater than both b, c.
Else statement will execute when the first If condition is False so, there is no need to check for a value. In the Else statement we are inserting one more if condition (Nested IF) to check whether b-c is greater than 0. If this condition is True then b is greater than both a, c.
Else c is greater than both a, b.